«Как мы уже упоминали, сетевое хранилище Thecus показывает хорошую производительность при наличии нескольких дисков, объединенных в массив RAID с защитой от сбоев. Thecus N4100PRO — это очень удачная система для небольшого офиса; ее также с легкостью можно использовать дома». 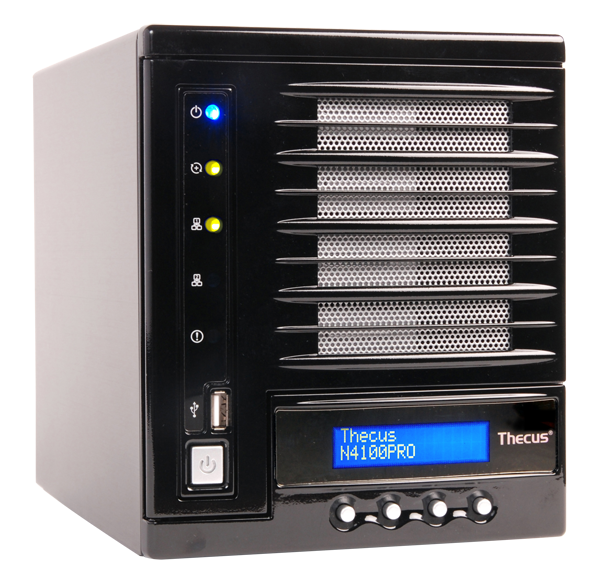 Equipped with a big, bright LCM module, the N4100PRO displays useful status messages such as IP address, date and time, and RAID status, making it easy for users to keep an eye on the condition of their N4100PRO. With the LCM module, N4100PRO users can even configure the unit in a dimly-lit living room for added convenience. The N4100PRO also improves on its predecessor by adding RAID 6 and RAID 10, providing users have even more options for data storage. What's more, the N4100PRO also supports RAID expansion, allowing users to add more storage to their RAID volumes as their needs arise. 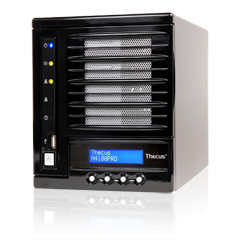 With the N4100PRO, users have the flexibility to store their data their way. Being able to connect to your storage unit at all times is essential. That's why the N4100PRO comes with network bonding in fail over mode. With this feature, the N4100PRO can automatically switch to its second Gigabit Ethernet port should the first one fail for any reason. The result is a zero network downtime and increased reliability for N4100PRO users. 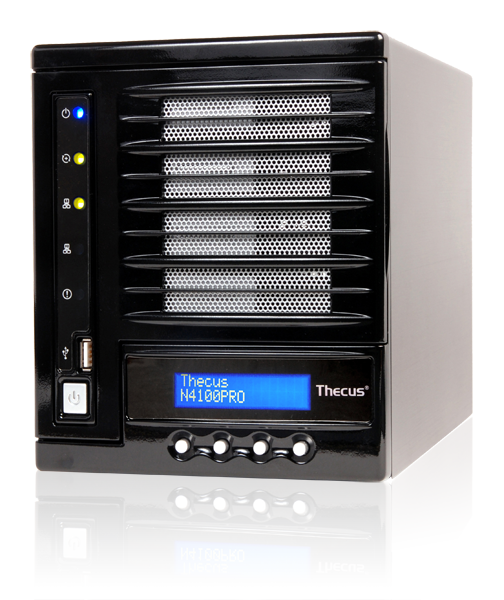 Those familiar with Thecus products know of their extreme performance. 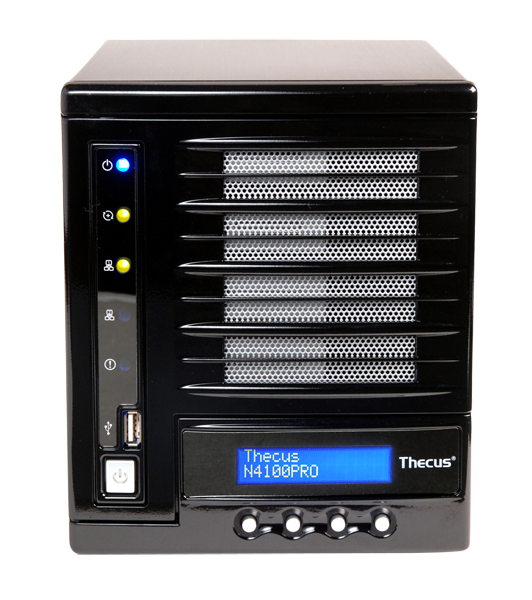 For the N4100PRO, Thecus has raised the stakes by more than doubling the data transfer performance of its predecessor, delivering data transfer speeds of 35MB/sec! Equipped with the N4100PRO, media enthusiasts and SMBs don't have to wait around when accessing their data. Powered by the AMD Geode™ LX800 processor and 256MB of DDR400 memory, the N4100PRO delivers the raw horsepower required to transfer files quickly and efficiently. With updated hardware and a ton of performance improvements, the data transfer speed of N4100PRO doubles that of the original N4100! Four 3.5" SATA hard disk bays enable sufficient storage for all usages, and users can manage this space with an updated list of RAID mode selections, including 0, 1, 5, 6, 10 and JBOD. The N4100PRO also offers advanced RAID management features, including RAID expansion and RAID level migration for ultimate flexibility. To top it off, the N4100PRO comes equipped with a big, bright LCM module, which displays useful status messages such as IP address, date and time, and RAID status, making it easy for users to keep an eye on the condition of their N4100PRO. With features like these, the N4100PRO is easier to manage than ever. Of course, raw performance is nothing without reliability, and the N4100PRO delivers this in spades. On the back of the N4100PRO are two Gigabit Ethernet ports that come with network bonding in fail over mode. With this feature, the N4100PRO can automatically switch to its second Gigabit Ethernet port should the first one fail for any reason. To ensure quality of service, the N4100PRO also comes equipped with link aggregation with 802.3ad and load balancing. The result is a zero network downtime and increased reliability for N4100PRO users. The N4100PRO also brings a huge selection of useful features to the table. 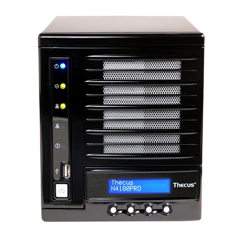 To keep multimedia moguls happy, the N4100PRO can act as a media server, iTunes server, and photo web server at the drop of a hat. The included download manager makes it easy to schedule and download BT, HTTP, and FTP downloads during off-peak hours, and IP Cam support allows users to turn their N4100PRO into a home surveillance unit. The N4100PRO can mount ISO files and share them across the entire network, and users can even further expand its functionality with module support.